If you’re presently in the process of planning a new extension or thinking about extending your home, bifolding doors may form part of this build in your home. You may even be taking of replacing your old French doors or Patio doors. It is quite likely you’ll need to consider the planning implications of your extension. In 2013 changes were announces in the planning laws. These changes are intended to make it simpler for any homeowner to extend their home without the usual administrative procedures required. Single storey extensions are a popular addition to all types of homes. Generally these changes apply to existing permitted development rights. It outlines that for detached properties a single story rear extension of up to 8 metres. For non-detached properties 6 metres applies. Under these changes no application for planning permission would need to be made in general terms. Even so we recommend you do check with your local Authority to see if there are any restrictions or special considerations for your own property or area. 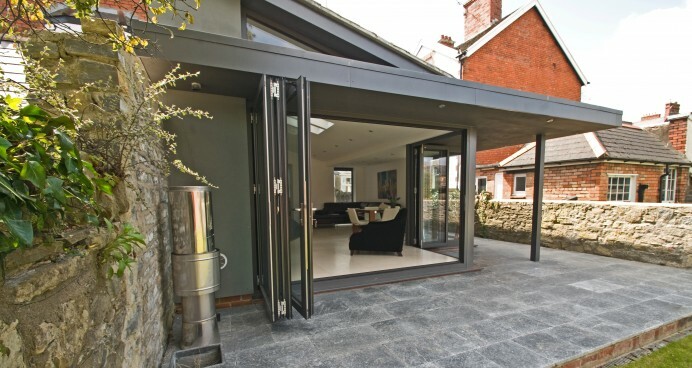 When is planning permission for bifolding doors required? In this article, we provide you with some generation guidance and information to help you. The addition of new doors or changing existing doors in your home is classed as a permitted development. Under a permitted development you generally should not need to obtain planning permission. If you’re property is in a Conservation Area or a listed property you should always check with your Local Authority or Planning Officer. Again our advice is to check nonetheless to be sure. It will save a lot of time later on. Changing existing doors in the home. For the replacement of your existing doors and presuming the sizes of the new doors are no different, we recommend you check that the lintels are adequate. We can advise on this or your local builder can assist you. Any new doors that also involves some form of structural change will need compliance with Building Regulations. You can submit an application to your local council for this. New extensions in the home. How your new extension affects neighbouring properties will need thought. Planners will usually look at boundaries and the impact any extension on your home may have on them. If there is an objection to your proposed extension this will be because it may be considered as having a negative effect on your neighbours. To avoid this think about the location of your extension, it’s overall size and whether it will affect or reduce the light into your neighbour’s home. For terraced properties in particular as well as some semi-detached houses this will be important. If your property is a Listed Building, in a Conservation Area or falls under any other kind of restriction we recommend you approach your local Planning Department. They’ll want to see how your proposed extension affects your home and whether it’s in keeping with the original property. Ensure the application is submitted correctly to avoid delays to your build. Do your research and seek advice from the professionals. Contact us for help and advice with your new extension. We’ve already helped many customers work through any planning implications and assist in making the process easier and less stressful. Contact us today and speak to one of our advisors if you’re thinking of building a new extension.